Appelbaum SH, Nadeau D, Cyr M. 2008a. Performance evaluation in a matrix organization: a case study (Part One). Industrial and Commercial Training 40(5): 236-241. Appelbaum SH, Nadeau D, Cyr M. 2008b. Performance evaluation in a matrix organization: a case study (Part Two). Industrial and Commercial Training 40(6): 295-299. Appelbaum SH, Nadeau D, Cyr M. 2009. Performance evaluation in a matrix organization: a case study (Part Three). Industrial and Commercial Training 41(1): 9-14. Ashby WR. 1956. Introduction to Cybernetics. Chapman & Hall, London, UK. Axelsson R, Axelsson SB, Gustafsson J, Seemann J. 2014. Organizing integrated care in a university hospital: application of a conceptual framework. International Journal of Integrated Care 14: 1-9. Bartlett CA, Ghoshal S. 1998. Managing Across Borders: The Transnational Solution (Vol. 2): Taylor & Francis, London, UK. Boudreau M-C, Loch KD, Robey D, Straud D. 1998. Going global: Using information technology to advance the competitiveness of the virtual transnational organization. Academy of Management Executive 12(4): 120-128. Burton RM, Obel B, Håkonsson DD. 2015. Organizational Design: A Step-by-Btep Approach. Cambridge University Press, Cambridge, UK. Davis SM, Lawrence PR. 1977. Matrix. Addison-Wesley, Reading, MA. Ford RC, Randolph WA. 1992. Cross-functional structures: A review and integration of matrix organization and project management. Journal of Management 18(2): 267-294. Galbraith JR. 2008. Designing Matrix Organizations that Actually Work: How IBM, Proctor & Gamble and Others Design for Success. Jossey-Bass, San Francisco, CA. Galbraith JR. 2012. The future of organization design. Journal of Organization Design 1(1): 3-6. Håkonsson DD, Burton RM, Obel B, Lauridsen,J. 2008. How failure to align organizational climate and leadership style affects performance. Management Decision 46(3): 406-432. Håkonsson DD, Burton RM., Obel B, Lauridsen JT. 2012. Strategy implementation requires the right executive style: Evidence from Danish SMEs. Long Range Planning 45(2): 182-208. Hansen MT, Nohria N. 2004. How to build collaborative advantage. MIT Sloan Management Review 46(1): 22-30. Knez M, Simester D. 2001. Firm-wide incentives and mutual monitoring at Continental Airlines. Journal of Labor Economics 19(4): 743-772. Levinthal D, Workiewicz M. 2015. Are Two Heads Better than One: The Multi-Authority Form and Organizational Adaptation. Available at: SSRN 2630088.
class="p1">March JG. 1991. Exploration and exploitation in organizational learning. Organization Science 2(1): 71-87. Moellekaer A, Pedersen ID, Kirkegaard H., Dissing Sørensen P., Eskildsen JK, Obel B. 2014. Organisationsdesign af de fælles akutmodtagelser. Fremtidens Hospital (pp. 251-266.). Copenhagen: Munksgaard. Nissen ME. 2014. Organization design for dynamic fit: A review and projection. 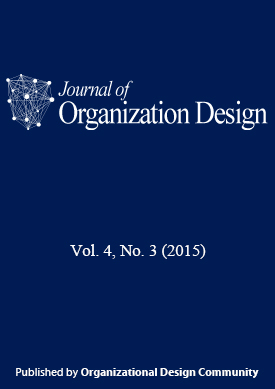 Journal of Organization Design 3(2): 30-42. Nissen ME, Burton RM. 2011. Designing organizations for dynamic fit: System stability, maneuverability, and opportunity loss. Systems, Man and Cybernetics, Part A: Systems and Humans, IEEE Transactions 41(3): 418-433. Park R, Appelbaum E, Kruse D. 2010. Employee involvement and group incentives in manufacturing companies: a multi-level analysis. Human Resource Management Journal 20(3): 227-243. Sy T, Beach L, D’Annunzio L. 2005. Challenges and strategies of matrix organizations. Human Resource Planning 28(1): 39-48. Vestring T, Rouse T, Rovit S. 2004. Integrate where it matters. MIT Sloan Management Review 46(1): 15.